Here's your assignment, should you choose to accept it. Plot the shortest, best and most direct route to pick up all the counties in white that lie north of I-20, beginning in the north and ending in Jackson. I was hoping to get it done in one day. 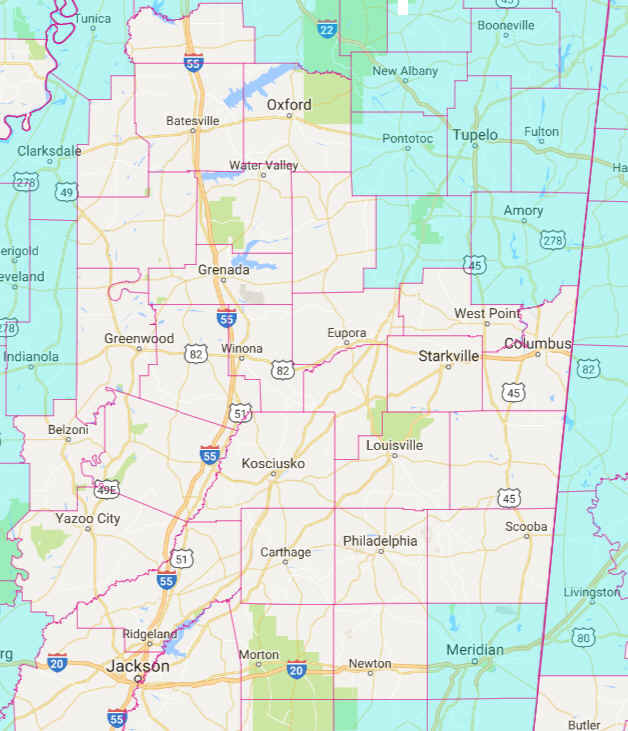 Wasn't sure if the northernmost counties would be best covered by zig-zagging across I-55, or using I-55 as much as possible and entering a county and then backtracking. Also, I know nothing about the grade and alignment of surface routes in that area to know if they'd be quick or slow. Well, I mocked it up on an image, but since you can't upload, I'm not going through the hassle to post it somewhere. Start with the first county on I-55. WB from Batesville. Go back east to I-55. SB to next county on I-55. WB out and back to next county. Pass over I-55 EB northeast toward Oxford. EB on US82 toward Columbus, cross county line, NB toward West Point, out and back. SB toward Scooba. North of Scooba, head SW toward Philadelphia. Northwest toward Koscuisko, doing an out and back across line toward Carthage. Keep NW toward Koscuisko, then north/northwest toward I-55 past Winona. Out and Back from Winona toward Grenada. Back to Winona, westbound toward Greenwood. Southbound toward Yazoo City, with an out-and-back toward Belzoni halfway. From Yazoo City, keep south/southeast toward Jackson. If you want to hit the two counties east of Jackson, just take I-20 in a round trip. Faster than extra mileage from Philadelphia. 490 miles, google estimate at 8h31m. *-- Google maps won't let me add another point. You must go all the way west to Greenwood, which will add a few more miles. Mississippi is a general flat terrain, with some rolling hills, and some more hillier stretches toward the far northeast. But, nothing mountainous. I've been to every county in Mississippi. I did something similar, getting that broad stretch, though I did have US82 clinched, and all of the US61 counties. But, I clinched from the south to the north, and used some of the Natchez Trace to head northeast. But, I had I-20 clinched, as well as the stretch NW of Jackson through Yazoo City and up through into Arkansas. But, also had NONE of the southeast Mississippi north of I-10 that got included in the round about way from Philadelphia to Scooba. The US routes are generally fast moving roads. Especially any four-lane. Most state routes can be slower going. Primarily due to towns slowing you down. Stick to US routes mostly in Mississippi. And for your general though, yes, doing a bunch of out-n-backs from I-55 is the better way to clinch the north.